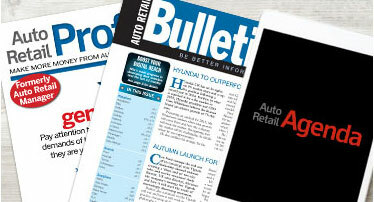 Stay in touch with auto retail thinking via leading monthly publications Auto Retail Bulletin, Auto Retail Profit and Auto Retail Agenda. Take the guesswork out of successful future business planning by investing in our specialist, in-depth auto retail market guides and reports. Join our informative webinars, events and conferences and discover exactly what you need to know about critical auto retail developments. Reports are published annually with selected updates available electronically. Auto Retail Network’s expert-led conferences and seminars bring leading industry executives together to share essential knowledge and insights. Its exclusive Auto Retail Live service also keeps senior decision-makers in the loop with the very latest automotive trends via convenient web-based presentations. The UK auto retail sector is a vibrant, fast-moving business landscape. And like any market subject to constant change, its success depends on senior executives with a forward-thinking, strategic vision. Not keeping up with commercial, technological and regulatory developments that happen on a weekly – or even daily – basis simply isn’t an option. Through our innovative magazines, reports and events, Auto Retail Network cuts through the burden of information that bombards the industry’s executives and decision makers. We prioritise, analyse and condense key developments and trends, and tell you what you need to know in as few words as possible. In a nutshell, Auto Retail Network keeps you better informed while saving you valuable time and energy. So instead of having to wade through countless pages of free trade magazines, you’re free to do what you do best: running your business.